The Etruscan obsession with elaborate burials leads us to suppose that they may have had an underlying belief, similar to the Egyptians that a part of the soul remained with the body, or at least that the body was important for the afterlife. Having said that, the earliest grave sites were cremations, with the ash being retained either in biconical urns, or urns fashioned to represent huts. Gradually inhumation burials began to appear, the first being in Tarquinia and Caere, and during the Orientalizing period eventually became the prevailing rite, except in northern Etruria, where cremation persisted right up to the 1st century BC, epitomised by the elaborately carved alabaster urns of Volterra. In the Orientalizing period the use of writing, the potter's wheel, and monumental funerary architecture reflected the accumulation of luxury goods of gold and ivory and exotic trade items such as ostrich eggs, tridacna shells, and faience. 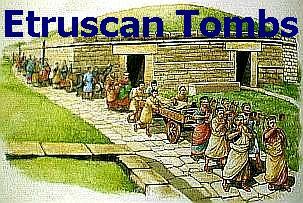 Many scholars hypothesize the existence of a powerful aristocratic class, and craftsmen, merchants, and seamen would have formed a middle class; it was probably at this time that the Etruscans began to maintain the elegant slaves for which they were famous. The passion for games was very widespread among the Etruscans. Besides the funereal games of the Phersu (See: tomb of the Augurs), other games of skill were popular ( See tomb of the Juggler): In this game, the objective was to throw a series of disks into a large wine crater balanced on the head of a female performer. The game of Pertica, consisted of a slippery wooden pole which competitors had to climb.Sporting competitions were important events in the Etruscan world and took place at religious ceremonies such as funerals. Athletic competitions took place in the stadiums while horse races took place in the Hippodrome. One of the most frequent competitions was the chariot race, as illustrated in dramatic detail in the Tomb of the Bigas in Tarquinia. In the arena jumpers and discus and javelin throwers also competed. The Tomb of the Olympic Games shows some graphic details of such sports together with crowds of spectators. The Tombs of Caere (or Cerveteri as it is known today) span an extensive timescale, from the Villanovan period right up until the late Roman period, but by far the majority of the tombs are those of the 6th and 7th Century BCE- a time when Caere reached its peak, and must have rivaled such cities as Athens and Corinth. The valley of the Sorbo, where the famous Regolini - Galassi tomb (c. 650 - 625 BCE) with its splendid Gold Jewellery was discovered, and the neighbouring hills of Monte Abatone, with its Torlonia tomb and Campana Tumulus, and the Banditaccia, which has over four hundred Tombs, in some cases forming veritable streets of the dead carved out of the volcanic tufa. Later tombs were generally underground, and take the form of huge hypogea , featuring stuccoes , paintings, carved pilasters and other features which imitate Etruscan civil architecture. Although tomb painting was extremely prevalent in Caere (particularly during the Orientalizing period) not as many paintings have survived the ingress of groundwater, in comparison to Tarquinia. In many cases, painting was used to emphasise architectural features, and were mostly painted directly on to the rock surface without any undercoat. In the typical hypogeum, steps lead down via an elongated entrance (dromos) to the main chamber (camera)of the tombs. The dromos usually points towards the regiones dirae of the underworld (South West). The hypogea generally consist of two or more chambers, imitating the typical layout of Etruscan houses, in some case with a Tablinium or other chambers off the main camera. The earliest archaeological remains at the original site of Tarquinia are 9th-century BCE Villanovan (Iron Age) well tombs. Cremation with ashes in a biconical vessel is commonly found from this period, but the earliest examples of inhumation also started to appear, contemporaneous with cremation sites, but possibly associated with varying family traditions. The famous Etruscan necropolis of Monterozzi, situated on a ridge southwest of the ancient city, contains the most important painted tombs in Etruria, mostly rock-cut chamber tombs dating from the 6th to the 4th century BCE. Today the location of more than one hundred and fifty painted tombs are known. The Tarquinia tomb frescos are well preserved in many cases, and we owe much of our insight into Etruscan lifestyle to the Tarquinia frescos. The Tarquinia frescos represent approximately 90% of all Etruscan necropolis frescos. One of the most famous is the Fowling and Fishing Tomb with its polychrome frescoes painted about 520 BCE. The tombs of the Lionesses(Leonesse), of the Augurs(Auguri), and of the Banquet (Bacchantes) (all 6th century BCE) show dancing and banqueting scenes. The Tomb of the Triclinium is the most outstanding 5th-century painted tomb, and the Tomb of the Shields is a masterpiece of 4th-century painting. A distinctive 2nd-century painting tradition, rare in Etruria, is found in the paintings of the Tomb of the Cardinal, and the Tomb of the Typhon. A serious conservation problem has arisen as many of the paintings have been attacked by moisture and fungus since the collection was opened to the public. A rich collection of articles from the necropolis is housed in the archaeological museum in the Palazzo Vitelleschi (1436-39) in modern Tarquinia. At the upper floor some tombs have been rebuilt with the original paintings. The race between chariots (bigas) where one is moved by the feeling of speed (from the "Tomb of the Olympic games"), the cruel game of "phersu" (in the "Tomb of the Bigas " ) or scenes of funeral banquets and dances and the rare representation of a big ship are the rare and fascinating visions of a magnificent past where Tarquinia imposed itself as one of the most flourishing centres of the Etruscan Civilisation especially in the 6th and 5th centuries BCE. 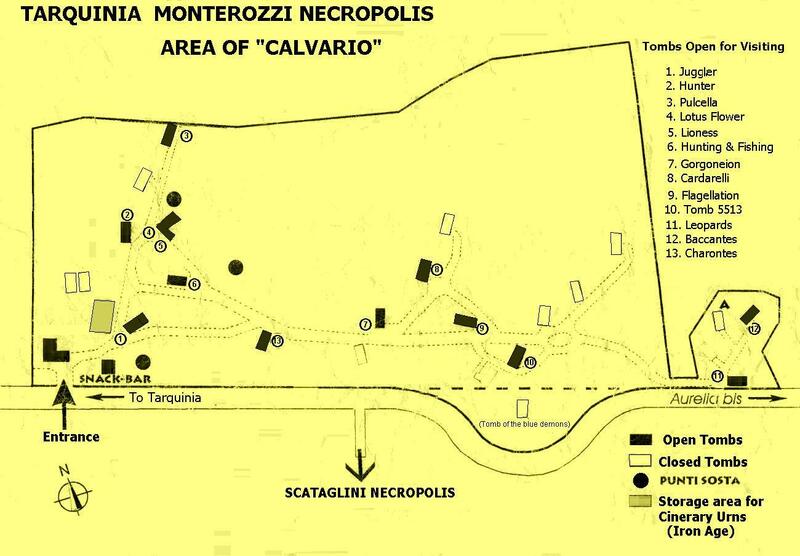 Click here for a "visitors" map of the Calvario area of the Monterozzi necropolis. The Tombs of Vulci date from the 8th Century BCE. The frescoes of one of its tombs, called the "Fran�ois Tomb" after its discoverer, are unique in that they show early scenes from Etruscan history. These paintings, which date from the 4th-3rd century, were detached and taken to the Museo Torlonia in Rome. From other tombs came remarkable stone sculptures and imported Greek vases. Four necropolises dating from the 8th century BCE have been found around the city of Vulci. The tombs of the 6th and 5th centuries BCE are generally of the sarcophagus type. Only a few inhumations are to be found, including the large tumulus of the "cuccumella". The habit of placing statues of imaginary animals to guard the tombs is characteristic of Vulci. Immensely rich burial treasures have been found in these tombs, in particular a large number of ceramics of Greek production, and bronze objects of local production. In the second half of the 4th century BCE, the tombs became of the hypogeal type and reproduce the shapes of the dwellings. The most well-known of these hypogea is the Fran�ois tomb, famous for its paintings (now at Villa Albani in Rome) portraying, as well as the deceased, episodes from Greek mythology together with characters from Etruscan myths and history. 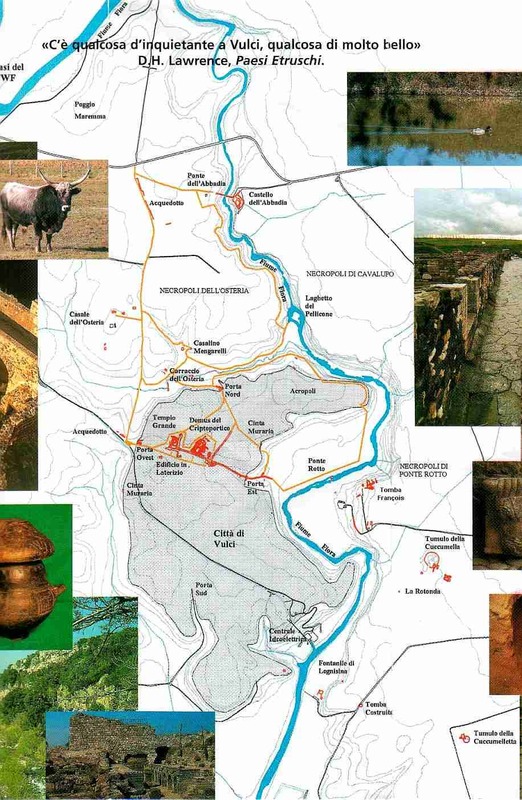 Click here for a "visitors" map of Vulci.